There was a point in my life where my husband and I had $11 in our checking account and it was supposed to last us 8 days. I remember how much it sucked—there really is no other word to describe it—and how hopeless I felt. It took us years—45 months to be exact—to be pay off all our debt, and it wasn’t an easy process. We made so many sacrifices along the way, including downsizing from a one-bedroom apartment and moving into a studio loft in someone’s backyard, with our dog. The stairs were dilapidated, the walls were pistachio green, the bathroom was tiny. But we made it work. And I can now look back at that time with fond memories, but I still will never forget of all the tears I cried, the arguments we had, and the stress—oh the stress! !—caused by not having enough money. If I had to give you any advice from someone who’s been there, here are my tips on how to stop worrying about money. Living paycheck to paycheck is no fun. Having creditors calling your phone is no fun. Like a diet to lose weight, you have to create an action plan on how you’re going to get your finances in order. Don’t know where to start? Look for resources! There are lots of resources out there to help you get started on learning about how to properly manage your money, this blog is one of them. Check out books from the library in the personal finance section. Find an author that speaks to you. Some people like Suze Orman, others like Dave Ramsey. 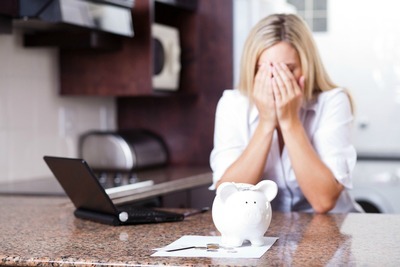 When you have a plan on how to get your finances in order, you know that there is eventually an ending to this money stress. There was a point where I was working 4 different jobs, seven days a week. But I knew that it wouldn’t be that way forever, and as long as I stuck with my plan, things would get better. So working kept me too busy to worry, and working also helped my financial plan. Give up the mindset of keeping up with your friends’ latest toys and vacations. Make yourself stand out and put yourself in your own class. You can no longer compete for the latest and greatest. You have to start living the life you can afford, and not the life you want. When you change your mindset, you give yourself the power you need and you stop letting money control you. I admit-these are not easy steps. But it really does take that moment where you finally say “No more” and get up and actually do something about it. Does Everyone Need to Follow a Budget?